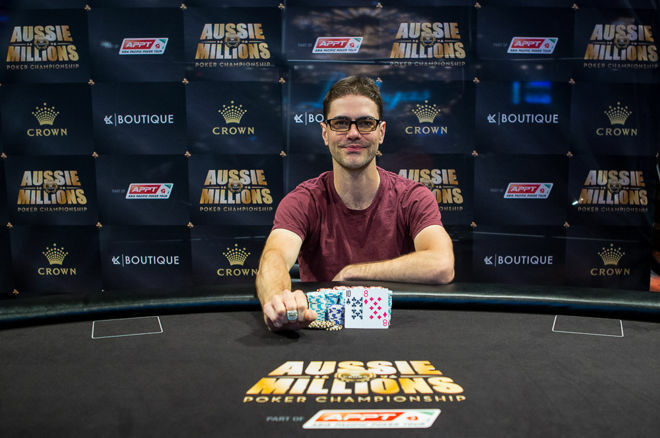 James Obst scored the first ring of the 2016 Aussie Millions when he took down the $2,500 H.O.R.S.E. event. On the third day of the 2016 Aussie Millions Poker Championship, Aussie James Obst won the first LK Boutique ring of the series, taking down Event #2: $2,500 H.O.R.S.E. inside the Crown Poker Room on Friday, defeating a final table full of local legends. 2014 Sydney Championships $5,000 Challenge winner Jarryd Godena was the first to exit the seven-handed final, and 2015 Australian Poker Hall of Fame nominee Michael Guttman bubbled the money finishing sixth. 2008 Victorian Poker Championship $100,000 Challenge winner Peter Aristidou was then eliminated in fifth place after getting in on fifth street in razz, heads up with Jan Suchanek. Suchanek made a seven-low on the river against his eight-low. Suchanek continued to run hot in razz, eliminating Australian Poker Hall of Fame member Mel Judah in fourth when he made a against Judah's , again on seventh street. Fellow Australian Poker Hall of Fame member Jason Gray then fell third, getting crippled in a stud hand before getting it all in against Obst in stud hi-lo, missing a low draw and ending up with a lower pair than Obst's. Obst took a 2-1 chip lead into heads up play and, after a back-and-forth affair that saw Suchanek climb back close to even several times, Obst ultimately won it to earn his second Aussie Millions title. Day 1c of Event #1: $1,150 No-Limit Hold'em drew a total of 371 players to the Crown Entertainment Complex on Friday. The biggest of the three flights so far, it brought the total entries up to 703, and put the event close to meeting its $1 million prize pool guarantee with one flight still to play Saturday afternoon. Recently retired Australian Rules Football legend and Australian Of The Year recipient Adam Goodes joined in the action Friday, but could not make it through the flight. Australian Poker Hall of Fame members Gary Benson and Van Marcus also bought in, but failed to survive. 2015 Aussie Millions Main Event champion Manny Stavropoulos took to the felt for this third flight as well, but joined the others on the rail before the flight was over. Once 12 40-minute levels were through, it appeared 58 players remained with Michael Seymour leading. The Aussie has a number of tournament cashes on his résumé from the Sydney area, including a win in the 2015 ANZPT Sydney $1,000 Six-Max No-Limit Hold'em event this past March. This group and the 52 through from the first two flights will fight for a seat at the nine-handed final beginning at 12:15 p.m. local time on Sunday, with survivors from Saturday's final starting flight also joining them. As a repechage event, players eliminated from previous flights may also reenter in the remaining flight. The 2016 Aussie Millions Poker Championship continues Saturday with the fourth and final starting flight for Event #1 beginning at 12:10 p.m. local time and the PokerNews Live Reporting team will be on hand to follow all the action.